The damaged climbing frame and slide at the Welfare field in Pegswood. A fresh appeal for information has been made following an arson attack at a children’s play area in Pegswood. A climbing frame and slide at the Juliet Oakley Activity Area in the Welfare field was badly damaged on May 11. The fire was deliberately started by use of an accelerant. Pegswood Fire Station manager Darren Nelson said: “While we make every effort to educate young people and prevent vandalism through schools education and youth engagement, I’m saddened and disappointed by this incident. 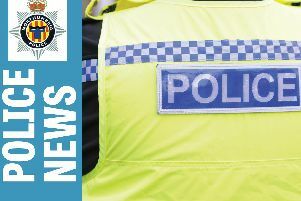 A joint investigation of the incident involving the Local Multi Agency Partnership is on-going – this involves Northumberland County Council, Northumbria Police, Northumberland Fire and Rescue Service, schools and service providers. Sergeant Sharon Wilmore-Greaves of the Morpeth Neighbourhood Policing Team said: “This mindless criminal act has caused considerable damage to the play equipment at the park, which is well used by local families and has caused concern in the community. Anyone with information should call police on 101, extension 69191, and quote log number 559 13/05/15. Alternatively, ring the independent charity Crimestoppers on 0800 555111.